The annual "Boekbindbeurs" (Book Arts Fair) will be arranged again this year November 5&6, 2011 by the Stichting Handboekbinden at the Pieterskerk at Leiden, The Netherlands. 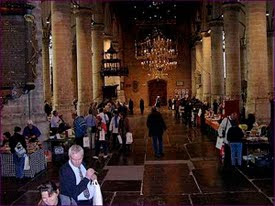 Please see Pieterskerk Event Calendar and Brief on last years Beurs for details. What a lovely location! Sorry that I can't make it this year.